This has nothing to do with the band White Zombie, as far as I can tell. Instead, this is more along the lines of 28 Days Later kind of zombie. I don't know what this beer has to do with zombies at all, but I'm going to chalk it up to stylistic and marketing decisions. Based on the previous Catawba beers, I expect this should be pretty good. Well, the beer isn't white (internal chuckle for my wit). 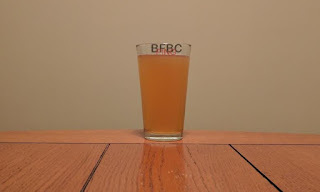 Instead, the very cloudy beer is not a neon yellow, but it is definitely yellow with a white head (what there is of it). No lacing happens, and that's pretty much expected with a white ale. The aroma is fresh dough and citrus. I didn't add the customary orange or lemon wedge to the beer, as I'm not that guy. Still smells pretty good. Am I a sucker for having purchased a beer based solely on the fact that it was co-branded with a heavy metal group I last listened to in the eighties? I mean - do they still tour? *quickly googles* Holy crap! They put out an album in 2016! I'm going to need to go back and listen to that after this beer to see if they're any good. The beer is a dusty yellow with a bit of orange and a very significant head. The head, however, leave almost no lacing while the aroma of bright citrus and yeast permeates the immediate area. It's a bit funky smelling, but that'll be the yeast, won't it? First sip is honestly very surprisingly good. It is citrus and grain heavy. It's crisp and flavorful without being too heavy with anything in particular. Honestly, none of the Sixpoint beers have really floated my boat. 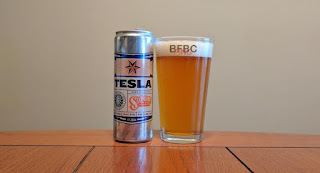 The reason I am giving them another chance is because they named this lager "Tesla," and I have an affinity for that particular individual. I still don't know what the deal is with the energy drink cans that they serve these in, but that's what they're sticking to. The pleasantly gold-orange colored beer has a patchy head with lots of lacing that is more reminiscent of an IPA than a lager. The aroma is similarly hoppy, but the malt is definitely stronger than most IPAs. It's an odd mixture of aromas, and I completely dig it. First sip is like Two-Face, the Batman villain (not the Tommy Lee Jones version, but close). The malt is high, sweet, and light. 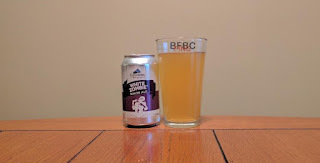 At the same time, the hops are headstrong, floral, and a bit piney; they really don't like being in this can with the malt at all, and they don't care who knows it. Maybe the world will make sense with a swig. 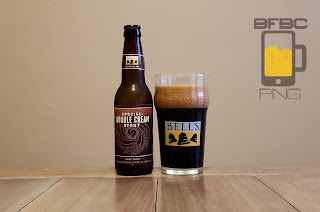 There was the outright fantastic Bell's Two-Hearted Ale and then the letdown of the Kalamazoo Stout. What does this mean for the new, supposedly special stout in front of me? It means there is the potential for greatness. I respect that potential, and I want to taste it right now - so I will. 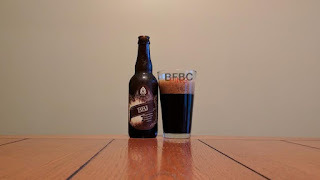 The brown-black beer (yes, I'm trying out that descriptor for these black beers for now, shutup!) has a very thin head made of exceedingly tiny bubbles that eventually leaves a central lilypad and a ring around the outside very artistically. The aroma is sweet chocolate, malt, and coffee. First sip is more bitter and has more oats than I expected. This isn't an oat stout, but I'm definitely getting oats from it. This isn't quite as upsetting as when those jerks put coffee in their beer and didn't bother to put it on the damn label, but it's a surprise. Maybe it's a side effect of the malt they're using or something, but it's oats. Another beer from Mantra. This beer seems like it has just a bit too much going on with all the extra stuff that might have been added. I really would like to see these guys making regular styles like a regular lager or IPA, but I guess I will keep taking what they give me and enjoy it. Yes, it's black. Wait - it's so brown/red that it's black. Same difference, dammit! The exceedingly minimal head is but a scant wisp of bubbles artistically flourishing out from the center toward one of the sides. The aroma is a very strong nut/vanilla/nut/cream/nut. I mean, it is strong. First sip is vanilla nut muffin with a sugar frosting and caramel drizzled over the top. The peanut is so heavy that I'm reminded of the Terrapin beer with all the peanuts, and not in a bad way. It makes me want a proper swig - and a proper swig is what I shall have. Here's the thing about Mantra - they haven't really produced a stinker that I've tried yet. This local brewer doesn't seem to run away from more esoteric styles, but I think I'd feel a lot better about them if I could try an IPA or a lager (although the Blonde was good on tap, but being on tap is cheating). The beer is gorgeous. It has a robust tan head that is thick and luxurious atop a deep, deep brown beer. The head dies down to a manageable thin layer with thickness around the edges of the glass while the aroma is solid oak, smoke, and I can definitely smell that bourbon lurking with its finely tuned sting. First sip is thick and more fruity than I thought. 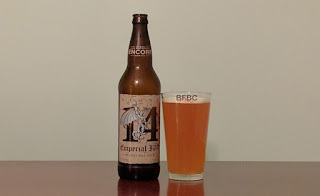 It has a kind of cherry-wood taste to it that mixes with the sweetness of the milk stout to make a tangy, woody strawberry milkshake with some white lightening added. The alcohol does spoil the taste a tad, but it's not enough to dissuade me from having a full swig of this beer. SPB has a good history with this blog. They produce pretty good beer (it's hard to really compete with the pure love that I heap upon Lagunitas) and I like to see new beers from them on the shelf. 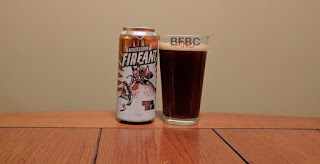 I'm not sure if the Fire Ant is supposed to mean that this is going to be a spicy take on the red ale or not, but I'm up for whatever experiment they want to try out. The beer is a very deep red with brown added to make it not as red as many other reds might be. The white head boils away to an uneven layer on top of the beer with some big bubbles surrounded by legions of smaller bubbles. The aroma is bready yeast, some light grains, and little else. That's not really surprising - my experience with reds is that they tend to be very mild. Another beer from the fresh local growler options at City Sliquors. I swear, they don't pay me for plugging them, but I have had too many bad experiences with crappy beer sellers, and I am going to hold onto a good one now that I found it. This is from New Heights in Nashville, and I expect it to be fresh and new take on the Double IPA style. The very hazy bright yellow beverage retains very little head - no more than a dusting. 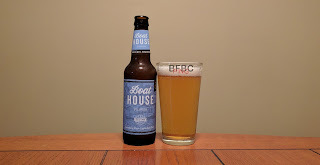 It has an aroma that is a very nice citrus and floral hops. Gentle grains blow in the wind behind it, giving it a kind of wheat beer mixed with a really hoppy IPA smell. 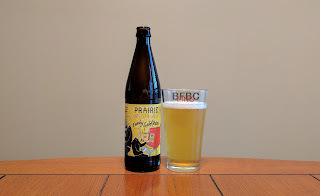 First sip is crisp and somewhat sharp citrus and flowers with a sort of funky yeast that gives a bit of flavor, but it doesn't overpower the rest of the flavors like one of the Brett beers would. It's nice enough, but sipping is for other men. I shall swig. My second Titletown beer, and the first one was certainly good enough that I was looking forward to trying this one. Again, this was a gift, and I am happy to get gifts of beer from pretty much anyone, but this isn't the first time I got beer from Michael, and it seems odd, as I'm pretty sure he's never read a single blog entry that I've written. The very clear yellow-gold beer sports a decent head that even manages some lacing, so we're going in the right direction with this. The aroma is a yeasty wort with grains and bread backing it up. It's a nice enough smell, and it reminds me of what a pilsner should smell and ultimately taste like, so I'm saying that we're firing on all cylinders at this point. This is my third beer from these guys. The first one upset me so much, I thought about driving down the road and hurling these other two at passers by. As I would never actually throw a bottle of beer at someone, I tried the second one and mostly liked it. This one at least says that it is sour on the front, but I honestly didn't look long enough to read the difficult-to-read script. I'll give them this - this beer certainly smells both funky and sour. It looks like it would be without much flavor, as the particular shade of "gold" is more of a pale yellow. It's pretty freaking well carbonated, though. I popped this open and was greeted with a massive cascade of bubbles dribbling everywhere. Even now, my hand has this peculiar funky sour smell to it that... isn't that bad. What more can I say about Stone? They are up there with Lagunitas in the perceived ability to brew about any kind of beer with an ability that transcends your average brewer. I don't know what exactly separates the guys who are really trying and miss a bunch from the guys who hit the ball out of the park almost every swing. The beer is about as hazy as it gets with its yellow-amber color and scant head. The simple bubbles around the rim are not very much of a remaining head, and the appearance is consequently very similar to most of the wheat beers I've had rather than an IPA. The aroma is spices, oranges, and a light malt. So, also not too dissimilar from a lot of wheats. Another beer gifted to me by a guy who doesn't drink beer. Did he choose wisely? Well, he certainly wouldn't know, but the previous two were at least enjoyable to try out (even though Packerland Pilsner could definitely been better). I am grateful for any opportunity to try a new beer, and this is one. 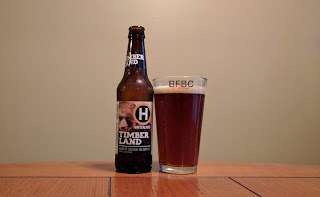 The beer is a deep brown with red tint and a thin head that disappears almost completely as the few bubbles that are left are right around the rim of the glass. The aroma is malt, nuts, and just a bit of berries. The malt is thick, sweet, and somewhat grainy. First sip is slightly tart with smoke and oak seeming to be front and center with this beer, even though I don't think I smelled either of them in the aroma. Sometimes, an unexpected change like that is good, and sometimes it's bad. In this case, it's not bad, but a sip is like looking at a masterpiece trough a mail slot. Time for a swig. From the brewer that put the Packers' name on a bottle of beer and sold it to the locals comes another beer for the land of cheeseheads. This one is a red ale, however, and that is a kind of beer that I have definitely grown fond of. As a style that is generally pretty mild, it's easy to do it right if you have the solid base to start with. The beer is a deep red with a head that boils down to a nice thin cap of white foam. It's not sticky like an IPA, but it still manages to leave some lacing, so that's good. The aroma is very malty with a kind of spicy hop base supporting it. 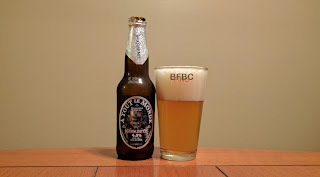 The aroma is very strong, and I noticed it as soon as I started to pour. It's very enticing. 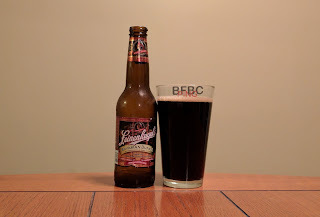 Surprising to me, black lagers are actually pretty reliably above average (usually). This one is from the batch of beers from the cycle-riding co-worker who gave me a six pack of assorted beers from his trip to Milwaukee, and I am not sure I can thank him enough. 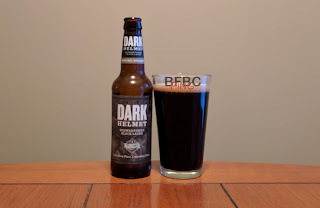 The beer is quite expectedly black, and it has a fine tan head on it that doesn't lave much lacing, but that's expected with a malt heavy brew as most lagers are. The bubbles are particularly tiny, but I don't think I would quickly mistake this for a Guinness or other nitrogenated beer. What is also a tip-off that this isn't Guinness is the smell. The aroma of burned oats and sweet malt are very distinct and easily discernible from even a fair distance.